Irrigation – Great Gardens, Inc.
One of the most frequent questions we get at Great Gardens is about drip irrigation. Many people are not familiar with drip and question the value of it. The benefits to drip are many and with water conservation being a focus in North Texas it is important for everyone to be aware of its advantages and cost saving features. 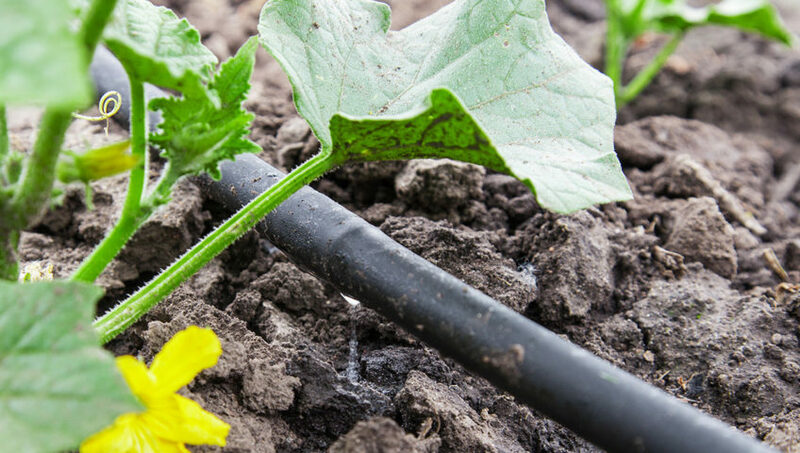 Drip irrigation is an efficient way to irrigate as it allows plants to be watered with tubing placed in rows along the ground. This process reduces wasted water through evaporation and wind and creates a stronger plant with the water going directly to the roots. Additionally drip reduces the over watering onto lawns, sidewalks, driveways and runoff into sewers and drains as is typical of spray systems. Another benefit of drip irrigation is the elimination of leaf wetness on plants. Because water is not sprayed onto the leaves it reduces the chance of fungus and disease thus resulting in healthier plants. Also with the uniformity of watering in all bed areas each plant receives a consistent amount of water which is not the case with spray irrigation. With the water restrictions that are in place in our area it is also an advantage to have drip irrigation since most districts allow drip watering on any day regardless of normal watering restrictions. If you are interested in learning more about drip irrigation and how you can reduce your water usage please contact us and we will be happy to discuss it further.